This is a re-post from the visit Martine and I made to the National Parks of Utah in 2007. Minor changes have been made to this post originally dated October 4, 2007. We were on a walk and ride with one of Zion’s park rangers when we learned an interesting fact. As we stood at a viewpoint looking at little-visited Menu Falls, the ranger explained that the water seeping from the sandstone cliffs had taken a long journey from the top of the cliff down to where it descended to the Virgin River. In fact, it took 2,000 years. When the water that poured out of the cliffs along their base appeared as rain on the Colorado Plateau, Caesar Augustus was Emperor of Rome and Jesus Christ still walked the earth. The sandstone that formed the cliffs of Zion National Park was formed from massive dunes that once covered the area. Then the area was under water some 260 million years ago, part of prehistoric Lake Claron. 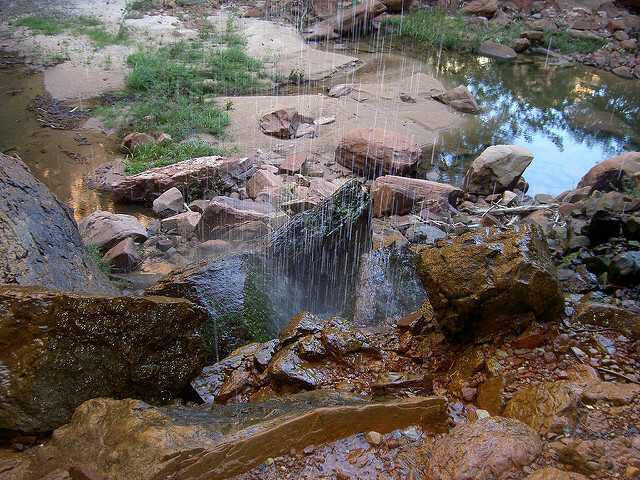 Calcium carbonate from the water seeped down to the sand and helped cement it into sandstone, along with the massive weight of the lake itself, so that millions of years later, it served as a slow and massive sponge that soaked up rainfall and sent it on a long, slow journey until it reached the base of the cliff two millenia later. Illustrated above is another one of those falls, at Lower Emerald Pool. In the extreme heat of Zion, Martine and I rested on a boulder with the deep shade and stray drops of cool (and very old) water helping us keep comfortable. The ranger had also mentioned that the sandstone purified the water in the process, but Martine and I had cool water in our canteens. I always take the precaution of leaving our canteens in the freezer so that we can be refreshed later in the day during our hikes. This entry was posted in repost, vacation and tagged lower-emerald-pool, utah, zion-national-park. Bookmark the permalink.